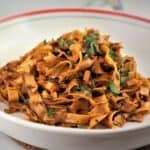 Chickpea Flour Tagliatelle with Garlic Paprika Sauce. This recipe is a combination of old and new. Old because when I was growing up my mother would sometimes make spaghetti with this garlic paprika sauce. I’ll explain further below. New because I recently began experimenting with chickpea flour and I am definitely enjoying it’s versatility. Ever since I began making Sicilian Panelle, I’ve been looking for new ways to cook with chickpea flour. My husband cut out most carbs a few years ago and therefore we don’t eat wheat pasta frequently at our house. I realized that chickpea flour pasta may be an interesting alternative, so I began testing this recipe. 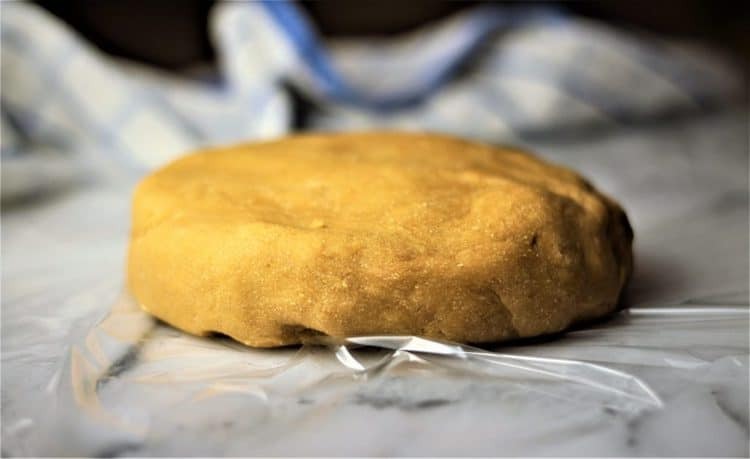 On my first attempt, I rolled out my dough a bit too thick and the combination of only chickpea flour and eggs resulted in a dough that my family and I found too hard and rather dry. I then tried adding a bit of water and olive oil and found this to be the winning combination. I won’t suggest that the texture is exactly the same as wheat pasta but my toughest critics enjoyed it! The water/olive oil combination results in a dough that is smooth and not as hard. Look at this beautiful golden colored dough! I also rolled it out at a thinner setting with my pasta roller. The dough is more delicate than your typical pasta dough therefore I recommend you work with smaller pieces, but it is definitely doable. After rolling it out and passing it through the tagliatelle attachment I gently placed the pasta on a parchment paper covered baking sheet, covered it with a dish towel, and placed it in the fridge until I was ready to boil it. Do not overcook chickpea flour pasta. Two to three minutes is sufficient otherwise it may break apart when you toss it with your sauce. So, let’s talk about the sauce. 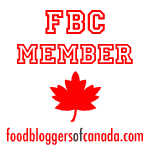 Have you ever heard of garlic and paprika sauce? I recall my mother making it every once in a while when I was younger. I think she’s forgotten about it as well. When I was thinking about a sauce that would go well with chickpea flour pasta I immediately thought of this one. I asked her about where it came from as I was preparing this post and she explained that she saw our neighbour (back when I was just 2 or 3 years old) make it and she then decided to try it out. I think it’s a perfect match for this pasta. It’s not overpowering and best of all it’s made with a few simple ingredients that you surely have on hand. An interesting variation on your typical aglio e olio for sure! In order to add some extra kick to this recipe, I added red pepper flakes since we love spicy food in our house. So, I’m presenting you with a few different possibilities here. 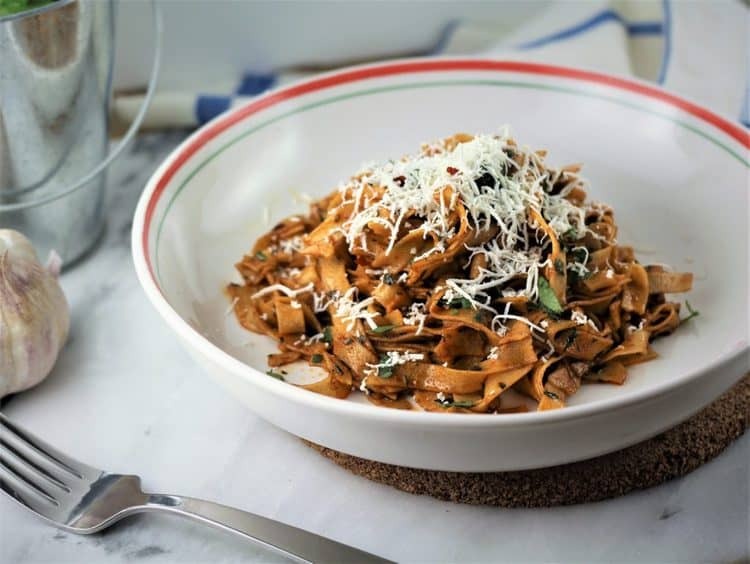 You can try the paprika sauce with store bought wheat pasta, which is how my mother made it, or make your own wheat tagliatelle with my recipe from my Tagliarini with Beans post. 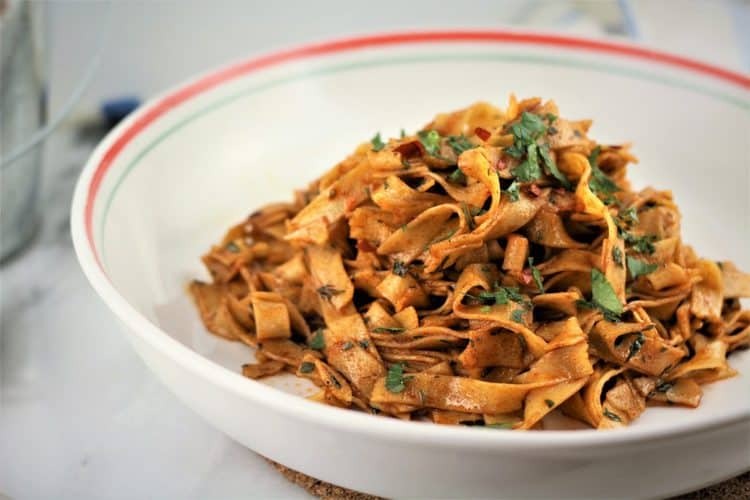 You can give it a try with this chickpea flour pasta, or try out the chickpea flour pasta with your own sauce and of course let me know how you serve it. Buon appetito! 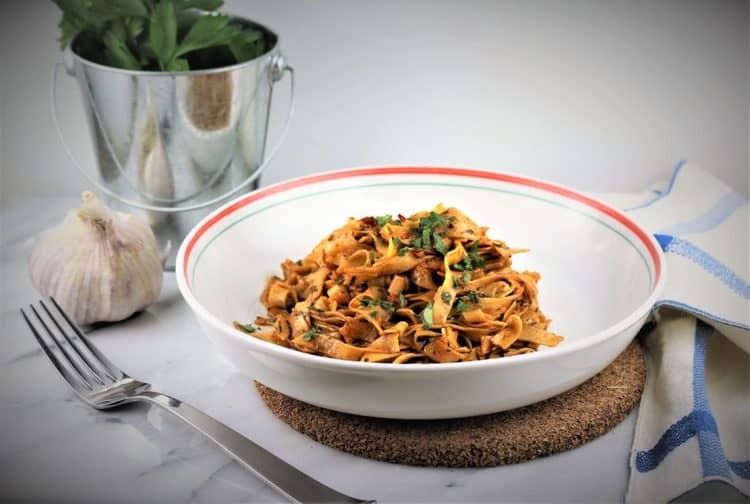 If you're looking for the perfect gluten free pasta recipe, Chickpea Flour Tagliatelle with Garlic Paprika is the perfect choice! This pasta pairs well with this delicious twist on your typical aglio e olio pasta sauce. 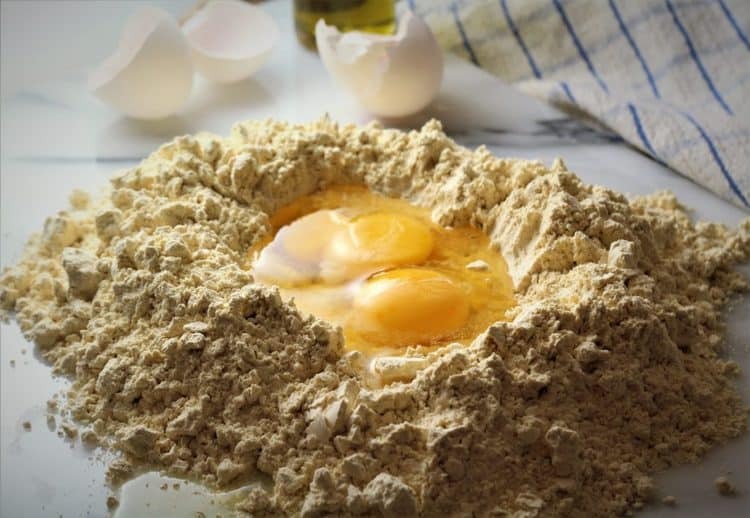 For the pasta: mound flour on a work surface, make a well in the centre and add eggs, olive oil and water. Using a fork, beat the eggs lightly and with your fingers begin incorporating the flour into the egg mixture to form a dough. If the mixture is too dry, add 1 tbsp. of water at a time, as needed. The dough should not be sticky. Knead until you have a smooth dough. Shape into a disk and cover with plastic wrap. Place in the fridge for 30 minutes. Cut the dough into 4 pieces and keep the pieces you are not working with covered in plastic wrap. Flatten a piece of dough with the palms of your hands and run through the pasta roller set at the widest setting. Fold the dough over and pass it once again at the widest setting. Continue rolling out the dough until you have reached the second-to-last setting. As the sheets of dough become longer and more difficult to handle, simply cut them in half. Cover the rolled sheets of dough with a dish towel and continue with the remaining dough. Place the tagliatelle/spaghetti attachment onto the pasta roller. 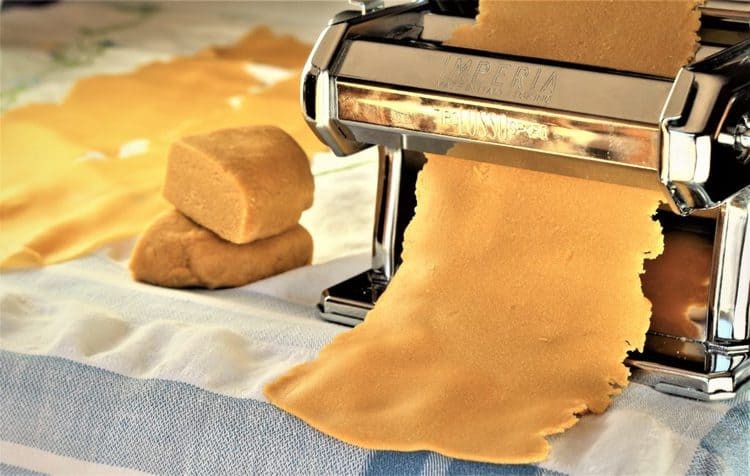 Roll the sheets of dough through the tagliatelle cutter. 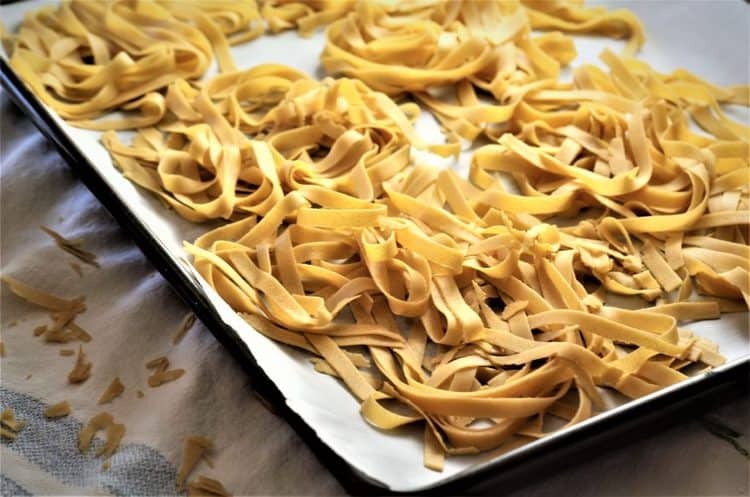 Place the tagliatelle on a parchment paper covered baking sheet, cover with a dish towel when done and place in the refrigerator until ready to boil. Bring a large pot with water to a boil. Add salt and cook pasta 2-3 minutes. While the pasta is boiling, in a large skillet (large enough to hold the cooked pasta) heat the oil, add the garlic, parsley and red pepper flakes and sauté for 2 minutes. Stir in the paprika. Add the cooked pasta, toss to cover with the sauce. Serve immediately with grated Parmigiano or ricotta salata.